“This year is the year of mobile!” … said every PPC strategist 3 years ago. It’s no longer “the year of mobile” – mobile traffic has already become the fastest growing–and possibly most significant–segment of paid SEM traffic. It’s time to take a fresh, actionable look at your mobile PPC strategy for both quick wins and any overdue capital improvement projects. If you’ve been ignoring mobile strategies in the past year or two because they’re a hassle and inconvenient, you’ve probably noticed your click and impression volume have been hurting for a while as well. All the conversion rate optimization in the world won’t be able to save you if you don’t bother going after this increasingly large share of the pie in the first place. Running a successful mobile PPC strategy is not as difficult as it may initially seem. If you follow these 7 suggestions, you’ll get yourself on the right track real quick. If your website is not yet optimized for a mobile environment or does not yet use responsive design, you need to get on that. Preferably yesterday. Nobody enjoys landing on a webpage on their phone and immediately having to zoom way in to read even basic text. Furthermore, nobody in their right mind will bother buying anything from their phone if the checkout process is similarly clunky and difficult to maneuver on a small screen. For context, this is the one element in this post which cannot be addressed directly within an ad platform like AdWords. However, it’s also the most important and impactful suggestion here. Without a mobile-optimized site, your metrics will suffer and a significant chunk of money dedicated toward mobile traffic will be wasted. 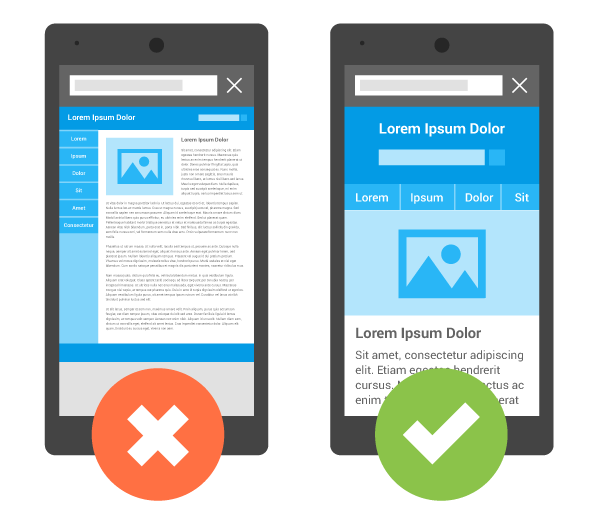 Display campaigns are notorious for their poor performance on mobile devices. When a user is on their phone, they’re likely using predominantly apps and will only briefly resort to online browsers to search or research something. Most users don’t enjoy being interrupted and taken out of whatever app they’re using on a smartphone. For this reason, it’s almost always a good idea to put a mobile bid modifier of -100% on any display campaigns you’re running. Conversion metrics almost always vary by device type. As such, you should use bid modifiers for mobile and tablet devices to compensate. This can save you money on your click and conversion costs. After these bid modifiers go into effect, you should see your campaign’s average CPA decrease accordingly. One thing to keep an eye on, though, is conversion volume. If you notice your campaign’s CPA decrease to $8, for example, but your conversion volume decreases from 100 to 90, you may want to make further adjustments to those bid modifiers to compensate any more. Expanded text ads allow you to use up to 140 characters between your headlines and body text versus the previous standard of 95 characters. By the beginning of next year, Google’s new(ish) expanded text ad format will become the standard which all accounts will use. One huge advantage of expanded text ads is that they tend to take up significantly more real estate on mobile search engine results pages (SERPs). If your ad shows up number 1 on a mobile device and you’re using an expanded text ad, you may very well take up most of the user’s screen. This can do wonders for your click-through rate (CTR) and click volume. This suggestion is a bit more advanced and only applicable to businesses that have their own mobile app. If you’re trying to re-engage with users who’ve downloaded your app, via remarketing lists for search ads (RLSA) or even a display remarketing campaign geared toward mobile users, you can deep-link text ads to a specific section on your mobile app versus a standard web URL. For more information on this, visit Google’s support page. Deep linking ads to highly relevant content within your app will save users time and frustration. However, you’ll need to ensure that any ads for a given campaign that utilizes deep linking will appear on a mobile or tablet device. You can do this by keeping bids very low ($0.05 or $0.10, for example) and putting a large positive bid modifier on your mobile and tablet devices. Or, you can exclude computer traffic altogether with a bid modifier of -100% (yes, you can do that now). If you have a support line someone can call for help or to make a purchase, you should use this phone number in a call extension for each appropriate search campaign. When creating a call extension, you can make it mobile preferred so it’s more likely to show up on mobile searches. The result will be a call button on the SERP itself alongside your text ad, which will allow the user to call you directly from the SERP rather than being taken to a landing page. This eliminates an entire step that a user has to take before potentially converting, which should improve your business’ conversion rate. Use as many other ad extensions as are applicable to your business. Sitelink and callout extensions, especially, can help take up even more room at the top of a SERP and improve your CTR. If you manage to show an ad in the top position for a mobile device, and you have sitelink and callout extensions display beneath your text ad, you could take up nearly the entire screen and drastically increase your visibility. Do you have any additional tips for mobile PPC? Comment below and share your ideas; we would love to hear them! Thanks for the tips Ryan. Great post Ryan! The tips you have shared could be of use to anyone trying to put together a successful mobile pay-per-click campaign.